Amazon says Whole Foods stores will continue to operate under their own brand and will continue to source products "from trusted vendors and partners around the world." Amazon is buying Whole Foods, in a merger that values Whole Foods stock at $42 a share — a premium over the price of around $33 at the close of trading on Thursday. The Internet retailer says it's buying the brick-and-mortar fixture in a deal that is valued at $13.7 billion. Whole Foods, which opened its first store in Austin, Texas, back in 1980, now has 465 stores in North America and the U.K.
Amazon says that Whole Foods' CEO, co-founder John Mackey, will remain in that role and that the grocer's headquarters will still be in Austin. "Whole Foods Market has been satisfying, delighting and nourishing customers for nearly four decades," said Jeff Bezos, Amazon founder and CEO, adding, "they're doing an amazing job and we want that to continue." 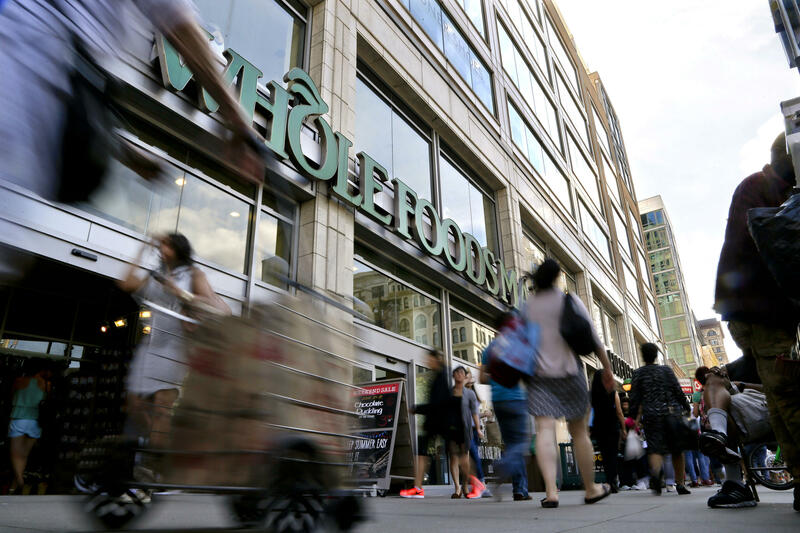 The sale, which has not yet been approved by Whole Foods shareholders, is expected to be concluded in the second half of 2017. For Amazon, the move furthers its push into in-person retail, a direction it has been moving in with its Amazon Go and "Fresh Pickup" grocery experiments. We've sent a message to Amazon asking whether the company plans to include Whole Foods in its same-day delivery and drone service plans. A representative had not returned the message by time of publication. Whole Foods released its most recent earnings report in May. At the time, Mackey said, "Our business is strong with record revenue of $15.7 billion, and over $1 billion in operating cash flow in 2016." But Mackey also said that "the operating environment remains challenging," and he promised to enact changes at the company to keep it competitive and profitable. In April, activist investor Jana Partners announced it had bought nearly 9 percent of Whole Foods' stock and was reportedly hoping the grocer would make changes to boost its value. Mackey called his new investors at Jana Partners "greedy bastards," in an interview that the Texas Monthly published earlier this week. "These people, they just want to sell Whole Foods Market and make hundreds of millions of dollars, and they have to know that I'm going to resist that," Mackey told Texas Monthly. "That's my baby. I'm going to protect my kid, and they've got to knock Daddy out if they want to take it over." Both Amazon and Whole Foods provide financial support to NPR.